was born in Paris in October 1973. He grew up mostly in Loiret, (Central France) but spent most of his holidays with his family in the Cévennes, south eastern France. It is certainly in these rugged yet generous mountains that his sensitivity to nature asserted itself little by little. After his baccalaureate in literature, visual arts and art history, he studied at l’École de l’Image d’Épinal, a visual arts school. During his 21-month non-military national service in an outdoor education centre, he discovered the job of environmental educator. After his national service, Marc completed his studies at the Fine Art School of Épinal and gained a National diploma in visual arts in June 2000. Sound then began to take an increasingly bigger place in his own work. In the following years, Marc moved away from Fine arts to work as an environmental educator for popular education organisations. At the same time, he met many people interested in sound art and wildlife recording. Since then, his work has been characterised by a dual approach, naturalist and musical, rational yet intuitive. Depending on projects, one approach prevails but never takes over the other completely. 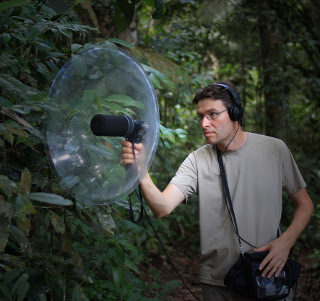 Since 2000, Marc has been living and working as a nature guide, wildlife sound recordist and sound artist in Lorraine (Eastern France).